Jack N' Jill Toothpaste is 100% safe for young children - especially because they have a tendency to swallow it, rather than spit it out. All Jack N' Jill branding is designed to be appealing to children and is cute enough that parents won't mind it sitting on their bathroom cabinet. 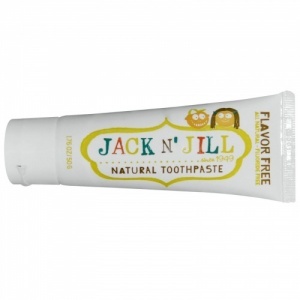 Jack n Jill flavour-free toothpaste is for kids that don't enjoy strong flavours. Aiming to make tooth-brushing fun, the toothpaste is rich in Xylitol and Calendula, for a mild formula that works to clean teeth, soothe gums and fight tooth decay. All natural ingredients. Safe to swallow. SLS Free. No fluoride, no preservatives and no added colour. Alongside the toothpaste it has designed and manufactured the first children's toothbrushes with handles that are made of NON GMO cornstarch, and are therefore biodegradable and recyclable. My kid is happy with this and uses this everyday without trouble. Happy with this toothpaste and my little girl has no problems using it. Nice natural ingredients in it. My 17-month-old girl didn't like the taste of toothpaste, but really likes this one, so it's a win for us! The gel means it's very easy to dose a small amount, so no mess and no waste. Also the flavour is mild.